SCiSupplier, is the only common solution for mulit-funder supply chain finance and dynamic discounting on the market. Honored with 28 prestigious awards, SCiSupplier has become the market standard, allowing buyers to increase their payment terms and generate substantial cash flow gains or improve their collected discounts by helping their suppliers get paid early. SCiSupplier can be used in virtually any currency and jurisdiction, allowing suppliers to receive funding at attractive terms and reducing the risk of supply chain disruptions. Today, SCiSupplier generates additional cash flow and improved margins for 17,000 companies in 22 different currencies and in more than 50 countries. Unique among any other accounts payable finance platforms, SCiSupplier can accommodate any financial institution or the buyer’s surplus cash to fund the supply chain finance and dynamic discounting program. Currently, we have more than 50 funders, including the worlds largest banks, nonbank funders, and capital market investors. SCiSupplier is the only solution on the market that gives you the freedom to use third-party funders and/or to self-fund your supply chain finance program. Using detailed payment term strategies developed by our SCiMap solution, our supply chain finance and dynamic discounting programs identify the optimal mix of terms, rates, and funders within a single platform and with one set of legal agreements. Countries and currencies can easily be added as your program expands into different jurisdictions. * If you’re looking to unlock more cash flow, we’ll gladly relinquish the keys. Pick and choose how much of your accounts receivables you want to trade. Get paid as soon as tomorrow. Lnkifins Prime Revenue platform creates transparency and eliminates risk. We bring buyers and their suppliers together in a live marketplace without intermediaries to find a real-time rate for cash flow. Our utility-based pricing model lets cash flow freely between companies at the unique rate that works for everyone. For any business, it takes an average of 60 days to be paid. 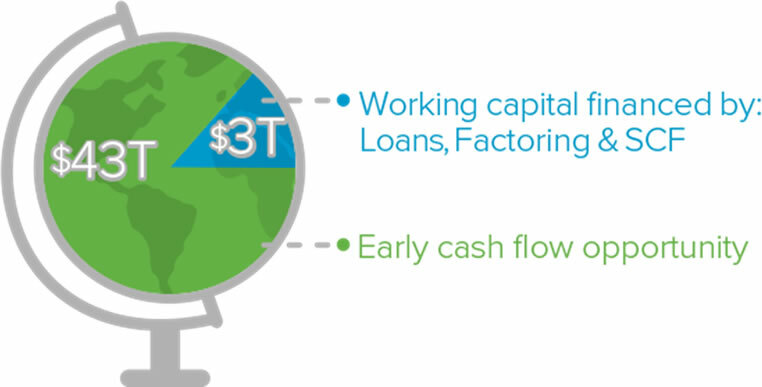 Additionally, funding options around the world are limited and only cover a small percentage of the $43 trillion in outstanding accounts receivable worldwide. Traditionally, working capital finance is provided by intermediaries with little incentive to create transparency or to make cash readily available for all companies. In this old model, borrowed working capital is risk-based and requires underwriting by third-party financial institutions. With PrimeRevenue, invoice processing between buyers and suppliers doesn’t change. Only the payment date and the invoice amount are changed, and to your advantage. Funders pay the suppliers directly, just as they would do normally, only faster. We’ve shown how PrimeRevenue fits into the A/P process for buyers. For the suppliers’ A/R process, it’s just as easy. PrimeRevenue provides suppliers with a simple award file that provides the new invoice total to keep transaction records accurate.